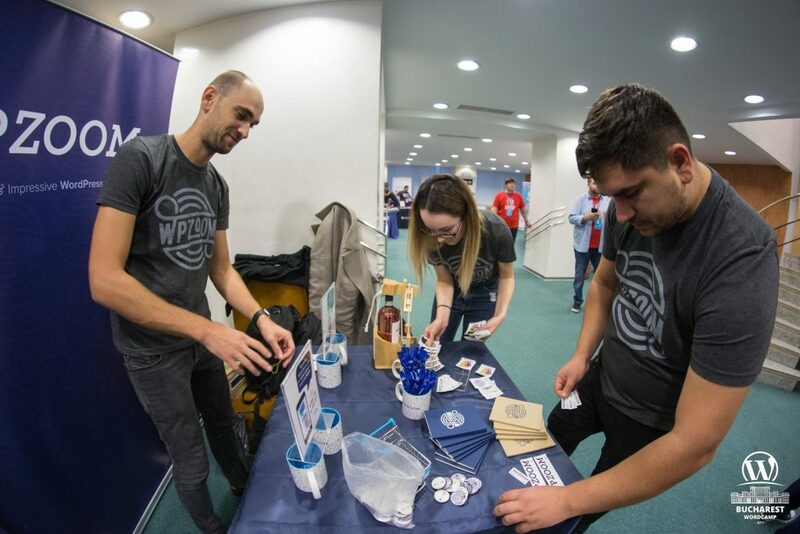 This weekend was the second year running of WordCamp Bucharest, and our the first time we’ve sponsored a WordCamp in-person. It was also a chance for the whole of the WPZOOM European team to meet up. 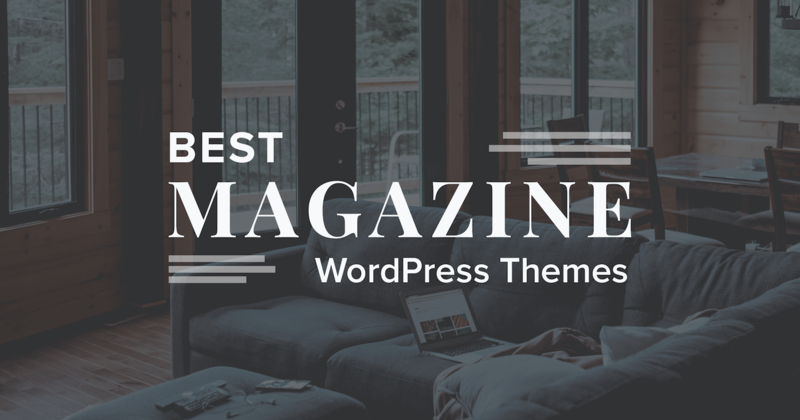 WPZOOM has been selling premium WordPress themes since 2009. Half the team is based in Chisinau, Moldova, with the rest distributed globally – I work remotely part-time from the UK. With no WordCamp in Chisinau (although we’ve recently started a meetup here), WordCamp Bucharest is effectively our “home” WordCamp. We didn’t make it last year, but this year wanted to attend, sponsor, and take the opportunity to get all the Europe-based team in one place. 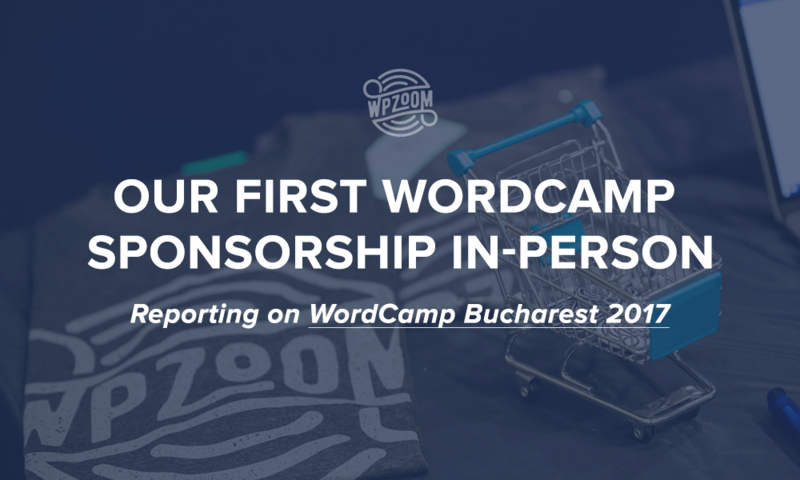 We’ve sponsored WordCamps before, but this was the first time we’ve sponsored in-person. 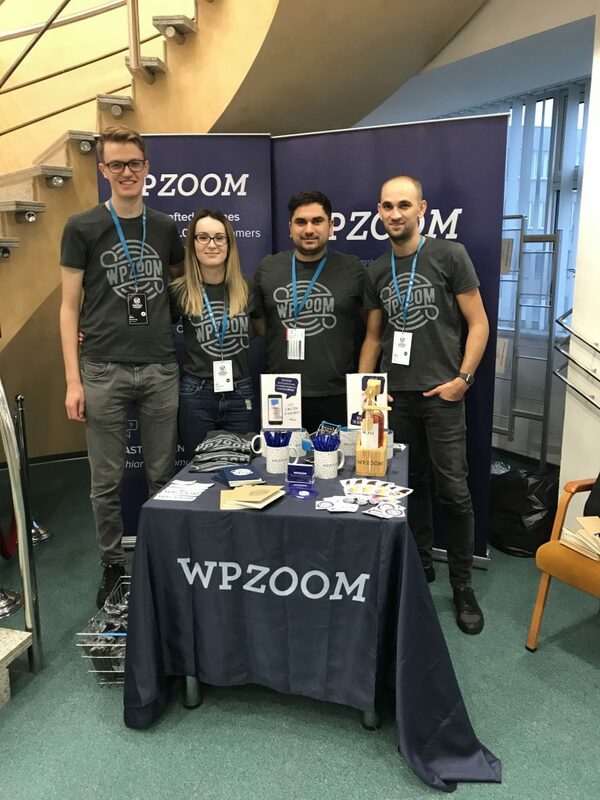 An online business such as WPZOOM can effectively operate from anywhere, but physical location still brings some challenges – and access to WordCamps in the local(ish) area is one of them. 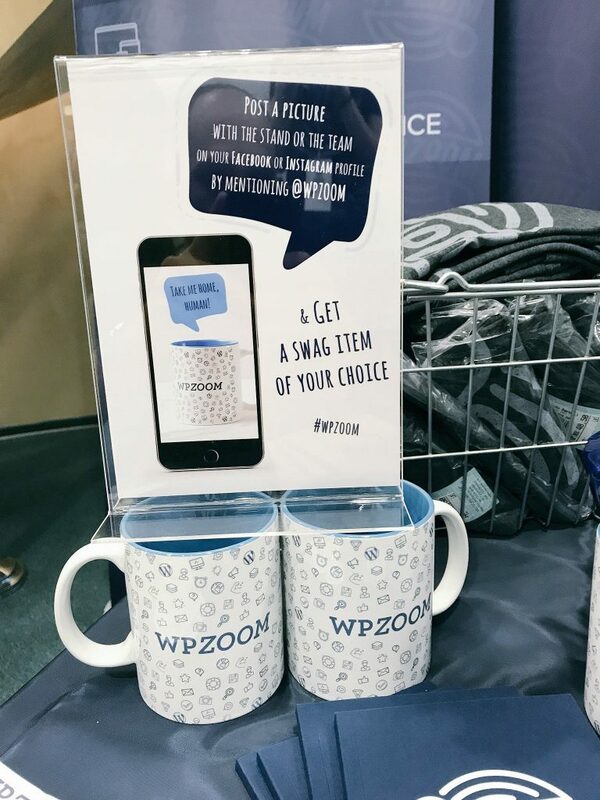 Despite selling WordPress themes for nine years, we’ve never had any swag, and finding t-shirts, mugs, and notebooks which were sufficiently high quality turned out to be a challenge. The swag, however, all came together at the last minute, with custom-sewn t-shirts – and even two bottles of Moldovan wine. I flew into Bucharest on the Thursday; Pavel, Ina, and Alexei arrived on the Friday, and the conference kicked off bright and early on Saturday morning. We got our stand set up, unrolled the banners, and (just about) fitted all of the swag into our designated area. As attendees arrived, it was fun chatting! We talk to customers a lot – through pre-sales questions, email, and our live chat, but it was really interesting to see how people used the website, which themes they were drawn to, and what questions they had. We’ll certainly be making a handful of changes on the basis of the feedback. One surprising thing which stood out was the lack of brand awareness, despite our relative geographical proximity. A lot of people interested in themes straight-up didn’t know who we are, or were only familiar with buying WordPress themes through ThemeForest. Interesting feedback to take home and act on going forwards. We had a lot of interest in our swag. Our 100 t-shirts were gone within a couple of hours, and we quickly had winners for both of our wine puzzle challenges. 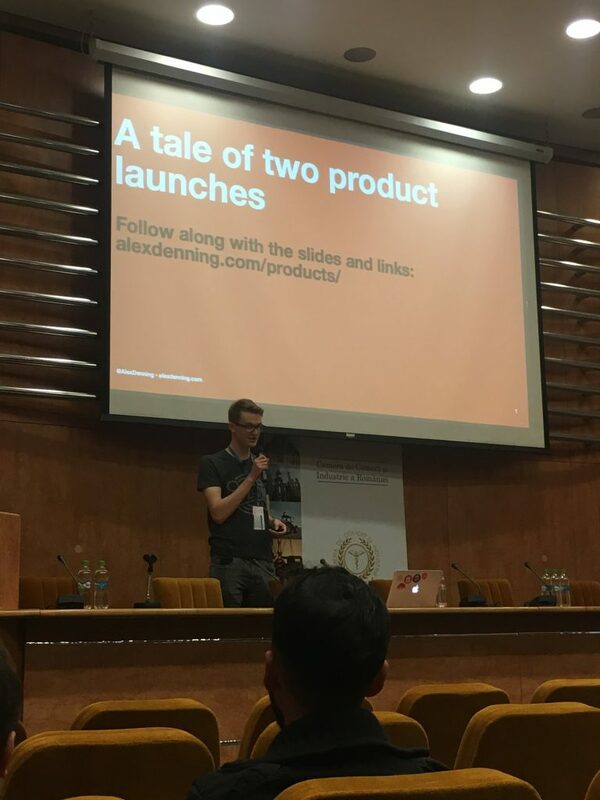 I had the pleasure of giving a talk, A Tale of Two WordPress Product Launches. This was a tweaked version of a talk by the same name I’d given at WordCamp Brighton a couple of months ago, and it was really good fun! I could talk for a very long time about product launches, but it was good to know precisely what I wanted to say inside out, have the space to tweak a little based on what people responded well to, and I think people enjoyed it. There were a number of other excellent talks throughout the day; hopefully they’ll be available for your viewing pleasure on WordPress.tv soon. High quality swag is really important if you’re going to do swag at all. Your goal shouldn’t be to give away 100 t-shirts, it should be to give away 100 t-shirts that people will actually wear. This is why we spent so much time and effort on getting the swag right, and it was heartening to see people wearing our t-shirts later that day at the after-party and on their way to work the next day (pictured below, Adrian from TranslatePress, who shared the sponsor space next to us). What’s more, giving swag away but asking for a small favour in return – in the form of a tweet or other social posting – was a transaction people were happy to engage in. We only did this for some of the swag (our mugs), and happily gave away the vast majority of the swag, but giving the option was a very acceptable way of doing things. Sponsoring WordCamps is expensive: there’s the upfront cost of the sponsorship; travel, hotels, food, swag purchases, and a host of miscellaneous costs. We are almost certainly not going to have a significant percentage of attendees buy our products and directly make a return on investment from attending the WordCamp. 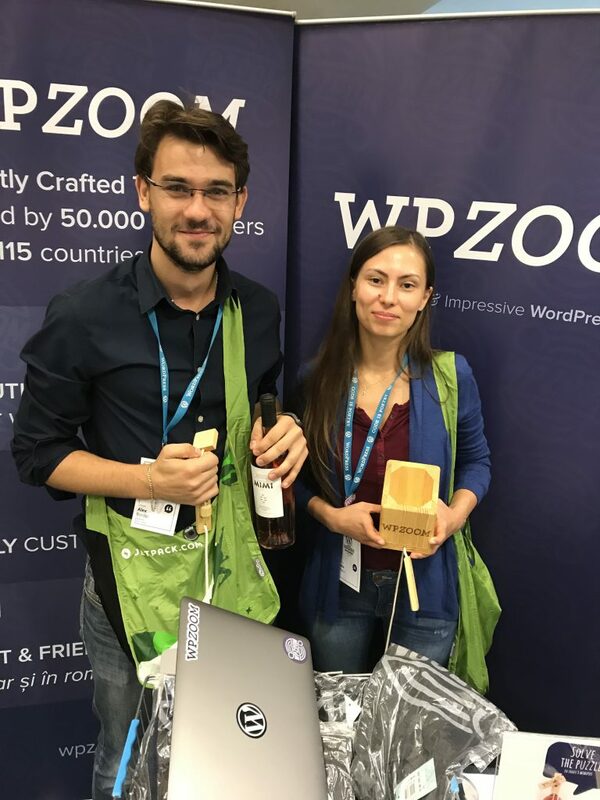 There are, however, indirect and non-financial benefits of sponsoring a WordCamp: we get to support the local community; we get to share and learn from our friends in the WordPress space; we get to talk to potential customers and find out what they do and don’t like about WPZOOM. These benefits are not to be ignored, and almost certainly make sponsoring the WordCamp worthwhile. 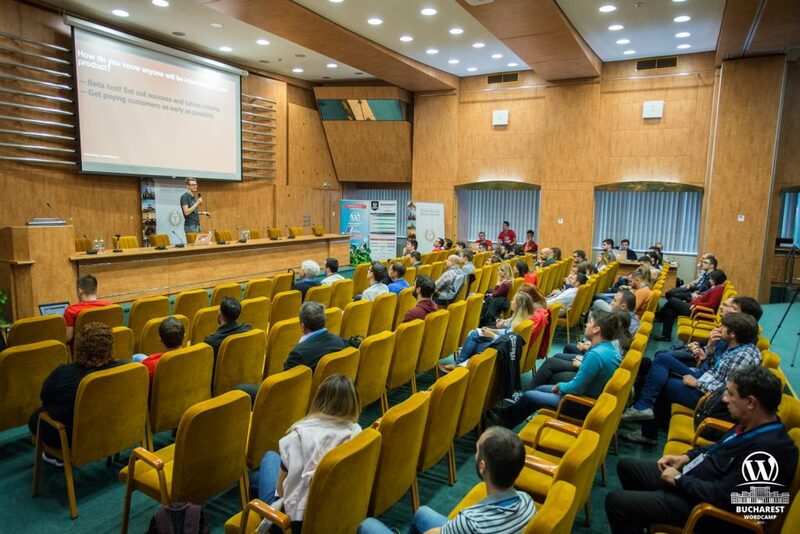 Whilst sponsoring WordCamp Bucharest was worthwhile, these benefits don’t scale; we’ll happily support local events, but you won’t see us flying to significantly more WordCamps in Europe or sponsoring WordCamps Europe or US. Sponsorship of those events will make sense for other businesses, but we’ll benefit most from keeping sponsorship local and small-scale. A huge thank you to the organisers; the WordCamp was one of the best organised I’ve been to, with an extremely impressive attention to detail. Thank you also to everyone who attended, spoke, and volunteered – it is, after all, the people that make a WordCamp really special. 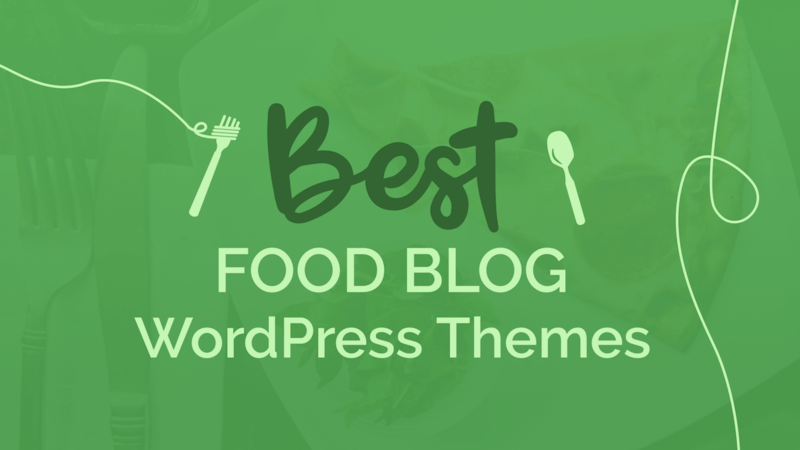 In the meantime, you should probably check out our premium WordPress themes, or let us know your thoughts in the comments or on Twitter. What an awesome image. Your team looks really good.